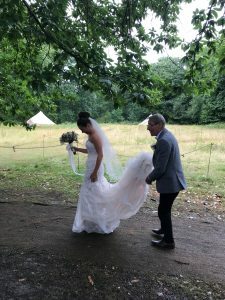 Kent Prestige Cars would love to Congratulate the Happy Couple, despite the heavy rain, Steph the Stunning Bride was Chauffeured in Style from her home in Sittingbourne to The Dreys Wedding Venue in Sittingbourne. She also needed two Mercedes Executive Minibuses to Chauffeur her 8 Bridesmaids, 2 Flower Girls and Mum and Dad. Nobody got wet as here at KPC we think of all needs and provided White Umbrellas, the Bridal Party was so relieved.